Solid wood coasters for entertaining for wedding favors, gifts or simply for your own use. 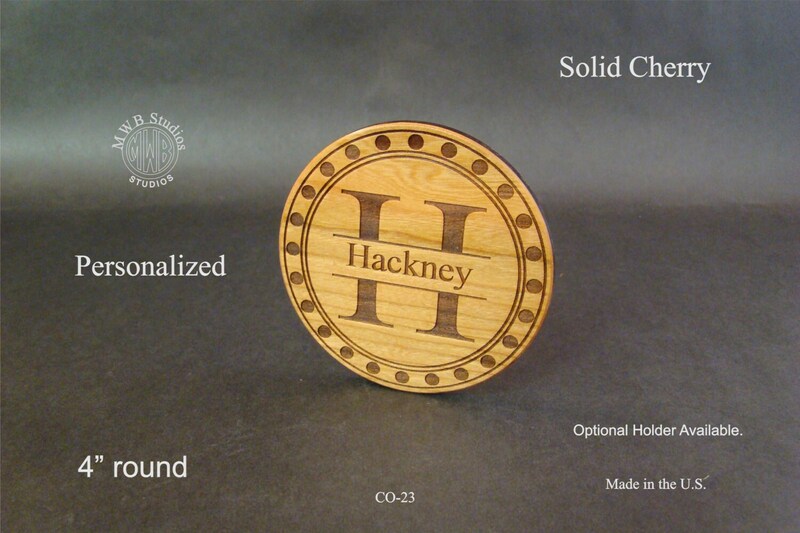 All our coasters are priced as a set of 4. The coasters are made with 1/4" solid cherry. They are laser engraved and then coated with a protective finish. They are 4" in diameter. OPTIONAL HOLDER: We have a solid cherry holder available for an additional charge. 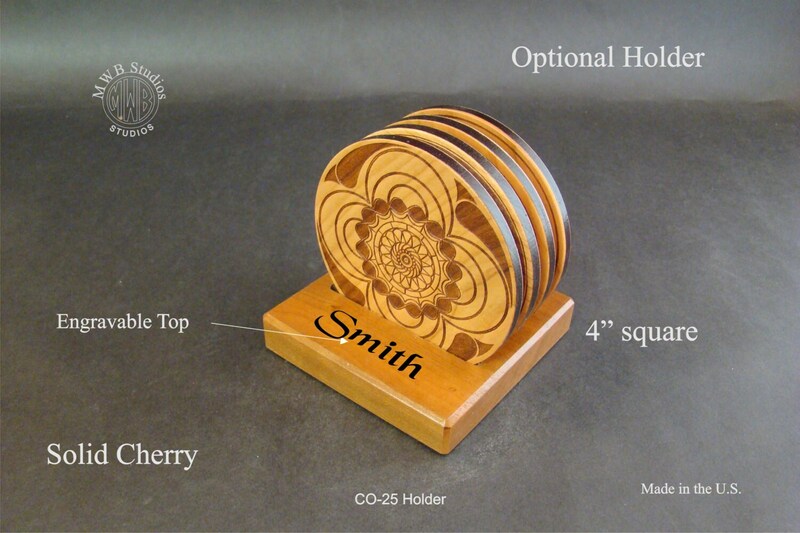 Choose coasters with holder in the options category when checking out and let us know if you would like to have something engraved on the front. We have dozens of designs and are working to add more. If you don’t see anything you like, let us know and we can custom make a coaster set for you. Want to mix and match, no problem!, just let us know in the comments section what four designs you want and we will make it happen. Need more than 4, again, let us know and we will work with you on quantity discounts. We also do volume discounts. Because we are dealing with wood, there may be slight variations in the surface finish. Please allow 3 to 5 business days for your order to ship. FREE SHIPPING. The free shipping is for the U.S. only. I ship first class mail which generally takes 3 to 5 days. I do offer priority shipping for an additional $6.00 and express overnight for $30.00. OVERSEAS: I do ship overseas and the countries I ship to are listed. If you do not see your country, just drop me a line and I will figure postage for you. My items are priced for the American market and do not include any duties or fees your country may collect.